Ultimate Success CDs - Network Marketing's #1 Training Program! "It's easy to succeed and make lots of money in networking marketing when you and your downline are trained with the Ultimate Success CDs!" 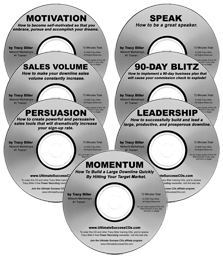 Tracy Biller’s Ultimate Success CDs contain the most competent, effective, and duplicable training ever offered in the 70-year history of network marketing. That’s why hundreds of thousands of network marketers throughout the United States and in nearly 60 countries are using Ultimate Success CDs to receive their training and to train their downlines. Now only $19.95 for the complete set! #1 Success-Training Ezine & Newsletter! Tracy Biller’s free weekly “Success-Training Ezine & Newsletter” are the network marketing industry’s all-time #1 training tools for delivering powerful and proven success strategies, training tips, and updates. Also as an ezine & newsletter subscriber you will receive access to free audio trainings, tips, industry news along with exclusive special offers and discounts that are not advertised on this web site. Subscription is FREE! Simply fill out the form below to begin receiving the valuable newsletter. "Without question the best audio training in the industry, bar none!" 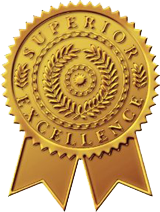 Tracy Biller produces the best audio training in the network marketing industry, bar none. The broadcast schedule and training topics are reserved exclusively for Tracy’s newsletter subscribers, hence yet another reason why you should subscribe to Tracy’s newsletter. 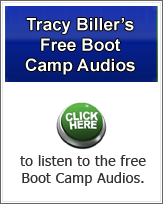 Click HERE to get access to the free boot camp audios! Where indicated, some of Tracy Biller’s Free Trainings come with sharing and redistribution rights as long as the sharing/redistribution is done with the training entirely intact in its original form, with no editing. This includes but is not limited to newsletters, MP3s, audio recordings, ebooks, reports, etc. Many of Tracy Biller’s trainings on his web site are free, and they come with free distribution and duplication rights. The intent of this is so that upline leaders will share Tracy’s trainings with their downline distributors and organization. In other words, the free trainings are to be used for education purposes only with one’s downline. RESTRICTIONS: Tracy Biller’s free trainings (including but not limited to Tracy’s Ultimate Success CDs, audios, newsletters, ebooks, etc.) may NOT be used in the following manner: to promote a network marketing company and/or business opportunity; to promote any sort of business opportunity, to promote and/or be used as “gift” – whether sold or given away free - with any sort of leads sales and/or leads generation business; to be placed in the “back office” of a web site subscription program; to be placed on a web site that requires a “password” for access; etc. Tracy Biller reserves the right to prohibit the distribution of his CDs and free trainings if he feels the user is violating the integrity and intent of the trainings.